France will suspend controversial fuel tax increases that have sparked weeks of demonstrations by the ‘gilets jaunes’ (yellow vests) movement. The u-turn, announced by French Prime Minister Edouard Philippe on Tuesday afternoon, follows a weekend of violent protests in Paris that led to hundreds of arrests and almost 100 people injured. Until now, French President Emmanuel Macron has been reluctant to suspend the price hikes, tweeting on Saturday that the protests were “nothing to do with the peaceful expression of legitimate anger”. 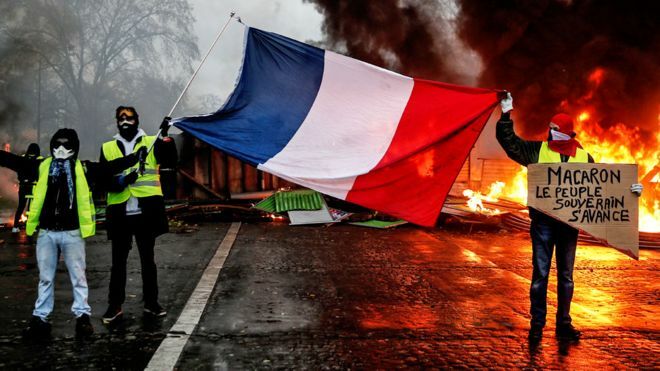 France has been hit by three weeks of protests from the ‘gilet jaunes’ movement, which was originally launched as a response to the fuel price increases, and has since turned into a wider protest over social inequalities. “We must change something”, said Philippe as he confirmed the government will suspend the increase of fuel taxes for six months. “This anger, you’d have to be deaf or blind not to see it or hear it,” he added. “The French who have donned yellow vests want taxes to drop, and work to pay. That’s also what we want. What is the UN migration pact that’s causing political turmoil in the EU?